Crazy Drone is officially recognized as an operator for NOT CRITICAL WORKS by ENAC. Find the publication directly on ENAC website by clicking here. Crazy Drone Pilots have attended training courses for specific flights APR AND possess a certificate of attendance to the “Qualification of Personnel Flight Systems for Aircraft and Pilot Remote” released on August 5, 2014, in addition to the second-level medical certificate issued by ENAC. Since the creation of the Regulation on the Civil Aviation Authority SAPR (ie drones), all those who fly for business have an obligation to take i professional liability insurance (RC) to third parties with a minimum cover required by law: Crazy drone is an insured operator. 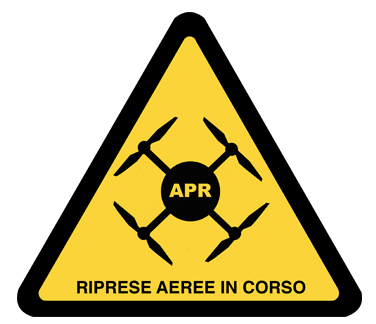 Since April 30, 2014 ENAC, the Italian Civil Aviation Authority, issued a law that regulates the use of drones. Resolution Ranked # 42/2013. The “Regolamento_APR_ed_1.pdf” is available at the following link: Rules Vehicles Aircraft Piloting Remote. The law is binding on all users of such systems to comply with rules and procedures. Companies that use these systems to the so-called aerial work must be certified by ENAC in order to operate. Right in the Regulation mentioned specifically the need for the user of an APR, to insure themselves concerning third-party liability, fit for purpose and not less than the limits imposed at a European level. Flight Rules The legislation distinguishes flight operations with April (official term that identifies the drones) between critical and non-critical operations. Privacy & Security & nbsp;The pilot, at any time, reserve the right to cancel or postpone the flight, offering an alternative date or location.